A video of two drunk men apologising for allegedly misbehaving with a woman staffer at Hyderabad’s Rajiv Gandhi International Airport has gone viral. The two men in the video, who are seen touching the feet of the air hostess from IndiGo, have been booked for creating nuisance, the Hyderabad police said on Monday. 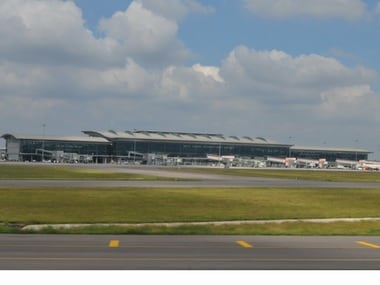 File image of Hyderabad airport. Wikimedia Commons. According to IANS, the men in their mid-30s, allegedly passed comments on her when she was returning home from duty. She approached a traffic police constable, who brought the accused to the police outpost on the airport premises. The accused, who were allegedly drunk were identified as Bharat and Kalyan and were seen apologising for their behaviour. They requested her with folded hands not to lodge a police complaint. As one of the accused kept saying sorry, the air hostess asked him to bend down. When he did that, she ordered him to touch her feet as the policemen looked on. She eventually did not lodge a complaint. The video was shot on Saturday midnight and has gone viral on various social media platforms ever since. 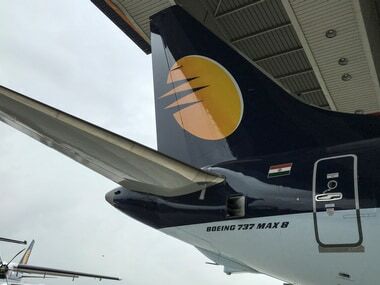 Sub-inspector at Rajiv Gandhi International Airport (RGIA) police station, Ramesh Naik said the woman did not lodge any complaint against the duo. According to PTI, the police said that the miscreants were students. He said the two were found to be in an inebriated condition and were booked for creating nuisance. The incident comes after a TDP MP harassed airline staffers after he was denied boarding by IndiGo for being late. 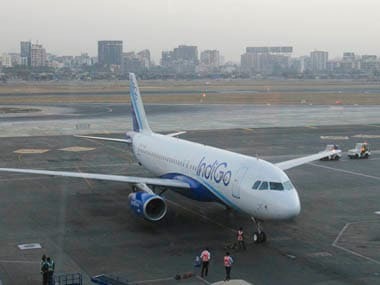 Another shocking incident of airport misbehaviour was when an IndiGo ground staff manhandled a passenger on Delhi airport's tarmac.